How to Differentiate Between Cold and Canker Sores. Cold sores and canker sores, while both painful annoyances, are caused by two different factors and appear in different oral locations. Cold sores are brought on by a virus and canker sores are caused by bacteria. Cold sores are contagious, while canker sores are not, but care should be taken to avoid the spread of infection or further irritation. Pinpoint the location of the sore. Canker sores are usually found inside the mouth, on the roof of the mouth, inside the lips and even on the tongue. Cold sores, on the other hand, usually appear on the outside of the mouth and lips. Assess your environmental and physical factors. Cold sores, in conjunction with the herpes simplex virus, can be triggered by things like stress, hormonal changes, illness, fever and bright sunlight. Since cold sores are contagious determine whether it's possible you may have shared a toothbrush, razor, towel, cup or silverware with someone who has a cold sore. 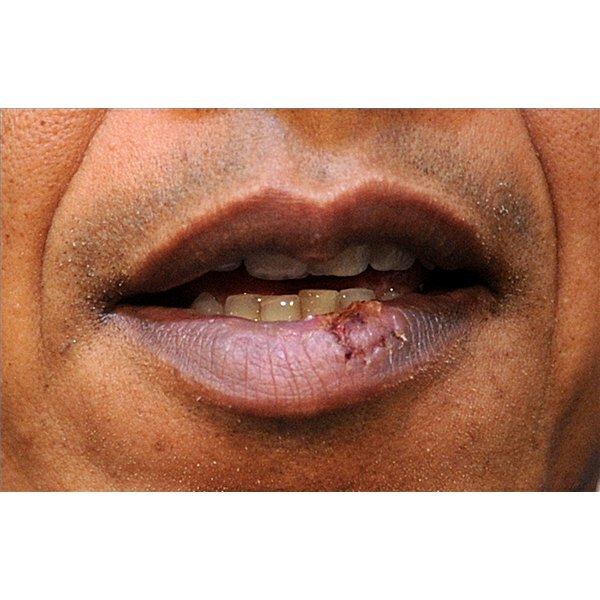 Compare the appearance of a cold sore with that of a canker sore. Canker sores start out as a small red bump with a gray, white or yellow center. The area around the sore is usually red and sore. You may see a cluster of sores. Cold sores are fluid-filled blisters that usually burst and leave a crusty scab-covered sore that heals in about a week. Note the stages of the sore. Cold sores go through a 5-stage process that lasts from 1 to 2 weeks. It starts as a tingly, itchy or burning sensation and then blisters appear. After the blisters show up, they begin to seep and burst, then form a yellow crust. Finally, a series of decreasingly smaller scabs form until the sore disappears.